One of my subscribers wrote to me with a question the other day. She started out by telling me that she is enjoying the eZine and appreciates getting my tips, and that she often feels inspired to follow some of the practices I share. Her problem, she says, arises very soon into her new resolve when, despite being motivated for all the right reasons and having the very best of intentions, she finds her newly minted complaint-free status has deteriorated into a twenty minute gripe-fest, or her planned four times a day stretch breaks have not happened a single solitary time this week! Well, what is up with my reader is, she is human. If you have ever resolved to do something, and really really meant it, and then found yourself not following through, you’re already familiar with how this works. While we might think of the human mind as a unified whole, the truth is actually quite a bit more complicated than that. It was Buddha who first said that the mind is like a wild elephant, that needs to be controlled by a trainer. But Jonathan Haidt takes this metaphor one step further in his book The Happiness Hypothesis. I’m holding the reins in my hands, and by pulling one way or the other I can tell the elephant to turn, to stop, or to go. I can direct things, but only when the elephant doesn’t have desires of his own. When the elephant really wants to do something, I’m no match for him. I love this metaphor because we as horseback riders can relate to it on a deep level. We are accustomed to dealing on a daily basis with creatures much larger and more powerful than ourselves. We get that force just isn’t going to work in exerting our influence and creating a working partnership. What is needed instead? Let’s use what we already know from training our horses to train our inner elephants. Here are my four top tips on how to train your inner elephant and rider to work together as a team. Just as your horse needs his basic physical needs met – lack of pain, and good adequate food, water, and social structure – before he can concentrate on learning new things and giving you great rides, your elephant is very much a physical creature. So, for example, if you want to lose some weight, don’t expect that the rider can just decide to eat a whole bunch less and the elephant will be fine with that. The elephant is not going to sit idly by while you starve yourself. More likely you will find yourself frantically pulling on the reins and drumming your heels on her neck while she lumbers straight for the platter of banana-chocolate-chip muffins. Even if you do resist eating, your body’s starvation mechanism will quickly kick in and lower your metabolism to burn less fuel, short-circuiting any planned weight loss. Out-manuevered by the elephant again! Instead, honour your elephant’s knowledge. The elephant knows that your body needs consistent fuel to function properly. Feed the elephant like you learned to feed your horse: good quality natural food, little and often. Eating clean nutritious food every three hours will keep your blood sugar stabilized, energy levels high, and your elephant will stay happily slumbering in it’s stall, not marching determinedly to the muffin kiosk in the mall! The training skill here is repetition. 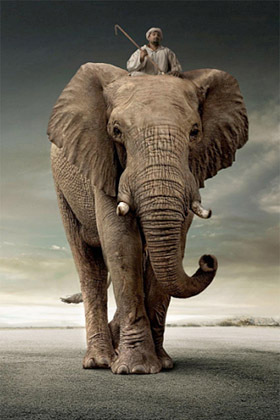 Just lead the elephant back to the habit you want to instill. In my reader’s example, it would be acknowledging that she dropped her intention, and simply starting again with her complaint-free practice or her regular stretching breaks. You might find yourself getting angry at the elephant. That won’t help you or the elephant (but you know this already from training your horse). You might be tempted to call the elephant names (“I’m hopelessly stiff!”, or “I’ll always be fat!”). First off, know that the elephant is not going to be persuaded by your anger or name-calling. And it doesn’t make a lot of sense to get angry or ridicule an elephant for doing what elephants do naturally. Just lead the elephant back. You can also remind yourself that it is in the nature of elephants to wander off. Just lead it back. This leading back again has a very Buddhist feel to it, but as a horse trainer you know from first hand experience just how practical it is. Same goes for your inner elephant. Study yourself. Know what triggers you. What was happening when the elephant started off in the wrong direction? Take a look at what pulled you off course. Stay on the lookout for stimuli that you know have distracted your elephant. Is it hanging out with habitually negative people? Watching toxic and depressing network news? Think about what you can do next time to head off the unwanted behaviour. Take action sooner, before the elephant has already charted a new course, while you still have a chance of being effective. The more advance planning and setup you can do, and the less consulting your feelings in the moment of execution, the better your results will be. If you decide that you are going to get up early to work out, when that alarm clock goes off and you are ensconced in warmth, and dark, and flannel, do NOT stop to ponder if you “feel” like getting up and working out. Of course you don’t! The elephant is just going to reach out it’s trunk, turn off the alarm, and snuggle right back in. Instead, stack the deck in your favour by laying out your workout gear the night before, have your workout routine planned, and when you hear the alarm, don’t pause for even a millisecond, just climb right out and get to it. You are both the rider AND the elephant. It is easy to lapse into the thinking that you are just your conscious mind, the rider. But, you are both, the rider and the elephant. Now, tell me your thoughts in the comments! Excellent analogy. I love the concept of taking situations we’re already familiar with handling when it comes to our interactions with our horses and looking at how the same theories actually apply to ourselves, as well. Great post! Excellent tips on Training Your Elephant! No wonder this page ranks so high in the google search! Thank you!